Patented one hundred years ago in 1912, the spiral wound gasket is the most frequently used gasket for high temperature, high pressure service. Whether you need a simple winding, or if you need inner and outer rings, Advanced Sealing can fill your needs with the latest in materials and design technology. 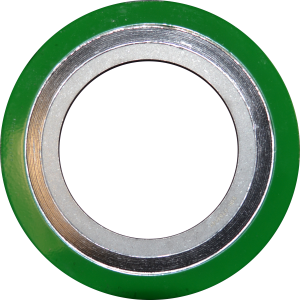 With ever-tightening restrictions being specified for the sealing of Volatile Organic Chemicals (VOC’s) and other hazardous chemicals, are spiralwound gaskets your best options? Will they reliably seal at the parts-per-million level that is now being demanded? A new laboratory study has conclusively shown how this 100-year old gasket design can be improved so as to meet the expectations of today’s workplace. In response to this study, the spiral wound committee of ASME is working to create a new class of low emission spiral wound gaskets. 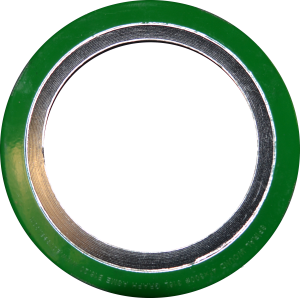 If you need this remarkable, low-emission spiralwound gasket, call Advanced Sealing – the only West Coast stocking distributor. Contact your Advanced Sealing representative for recommendations on the use of inner rings. Also for custom sizes and shapes please call Advanced Sealing. 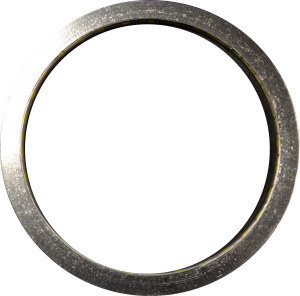 Click here for spiralwound gasket sizes. Advanced Sealing’s Style S Spiral Wound gasket is a “winding only” product that is designed for use in all applications that utilize a machined groove for gasket containment. This includes valve bonnets, tongue-and-groove flanges, and other special applications. Notes: 1. 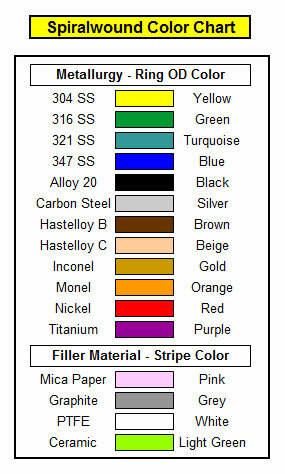 Other metals can be specified to meet the demands of your application. Available metals include 321 SS, 347 SS, Alloy 20, Hastelloy, Inconel, Monel, Nickel and Titanium. 2. Other filler materials include PTFE, Ceramic, and Mica Graphite. Advanced Sealing’s Style SW Spiral Wound gasket is made up of a spiral wound sealing element with an outer guide ring that serves to center the gasket in a standard flange. It is manufactured to the dimensions of ASME B16.20 for use in ASME B16.5 and ASME B16.47 flanges. NOTES: 1. Other metals can be specified to meet the demands of your application. Available metals include 321 SS, 347 SS, Alloy 20, Hastelloy, Inconel, Monel, Nickel and Titanium. 2. Other filler materials include PTFE, Ceramic, and Mica Graphite. 3. When not made of Carbon Steel, the usual call-out is the same as the metallurgy of the winding. Advanced Sealing’s Style SWI Spiral Wound gasket is made up of a spiral wound sealing element with an outer guide ring that serves to center the gasket in a standard flange, and an inner ring to prevent inward buckling of the winding. It is manufactured to the dimensions of ASME B16.20 for use in ASME B16.5 and ASME B16.47 flanges. NOTES: 1. Other metals can be specified to meet the demands of your application. Available metals include 321 SS, 347 SS, Alloy 20, Hastelloy, Inconel, Monel, Nickel and Titanium. 2. Other filler materials include PTFE, Ceramic, and Mica Graphite. 3. When not made of Carbon Steel, the usual call-out is the same as the metallurgy of the winding. 4. The inner ring may be made from a non-metallic material such as PTFE to provide chemical protection to the gasket, however PTFE will not provide protection against inward buckling.